My meetings started here this morning. As my grandfather would have said it, "We couldn't have had a prettier day." And, it's AUGUST. In DC. 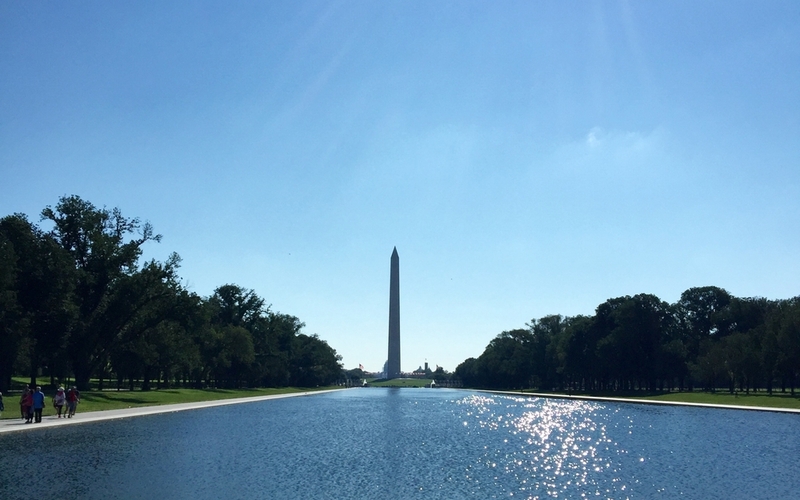 Gorgeous weather aside, I had the pleasure of working with a group of scientists gathered in DC this week to share their climate change research and talk about the challenges they see in doing this work going forward. As is so often the case with highly-skilled experts, the technical challenges are big-- no doubt-- but those don't scare them. The issues that keep them up at night are around talking about their findings, building understanding and acceptance, gaining support, and, ultimately, seeing behavior change. In short, all of the communications stuff. I learned this week that answering the common question, "what do you do?" can start a debate in a bar. The vested man above is Paul Ollig. 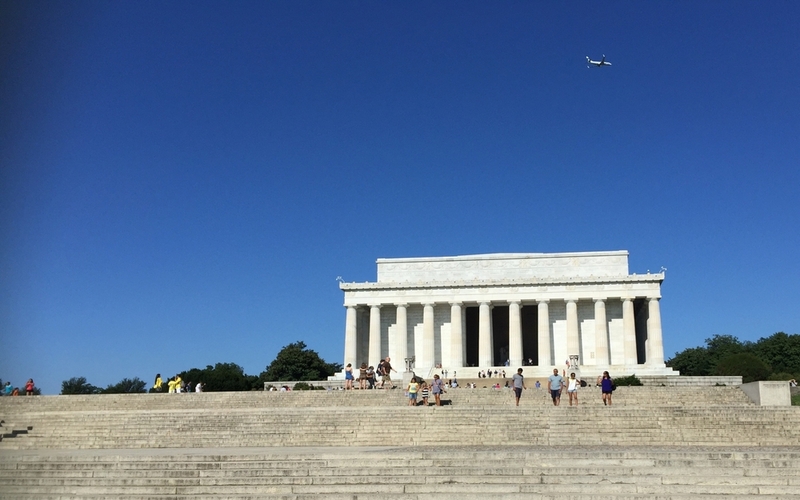 He's a National Park Service employee and the Chief of Interpretation for the National Mall and Memorial Parks. He's a fantastic storyteller-- if you ever have a chance to walk the Mall with him, you're guaranteed to learn something new. 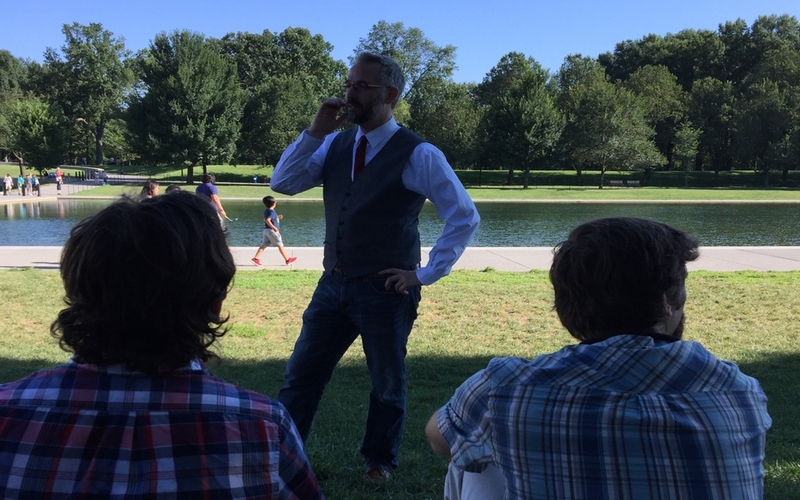 So, Paul led a tour today for this group of climate scientists to talk about climate change impacts to the Mall and the city and park's adaptation efforts-- including the construction of a massive levee to protect the monuments from storm surges. Before setting off, he opened up a discussion on what techniques are effective when talking about climate science. The insights shared by the group were great-- and I think can be a good starting point to communicating any highly technical and controversial material. Humanize your work. Describe why you personally are drawn to the specifically challenges. What experiences or beliefs lead you to this point? Chunk the message. Talking with someone who is incredibly knowledgeable and enthusiastic about their work can feel like being sprayed with a fire hose. Be able to chunk your message into "bite site" points and know how to sequence them in case people ask for more information. Avoid trigger words (audience-dependent). Know your audience and what trigger words might cause them to shut down and stop listening. For some, "climate change" are those trigger words that have such a strong association that it might be difficult to overcome someone's position. The goal often is to talk about the impacts, the risks, the behavior changes needed, etc. Being flexible enough to do that with more general language can keep a much-needed conversation going. Make it visual. Snow, I learned, is a visually compelling way to talk about climate change. What are the pictures that help people understand the risks and impacts of your issue? Use those. Take opportunities to talk with kids. Of course, any conversation with a kid has to be age appropriate-- and ideally pre-approved by a parent or teacher. The point is though that kids help you test how accessible your message is. Can a 5th grader understand your point? Kids will also has great questions and will typically come to a conversation with fewer preconceived ideas. If nothing else, you both might learn something. One of my colleagues has this great picture of Einstein with a quote that reads, "If you can't explain it simply, you don't understand it well enough." I love this because it's so true. Times (many, many times) in the past that I've stumbled over technical messages have come down to precisely this problem. My understanding was more superficial that I realized. Engaging with an active listener can quickly reveal those holes. So, if there was one overarching recommendation, it would be to know your topic well. Know it so well that you can avoid jargon or terms that only another technician would understand. My key takeaway from meeting with these awesome scientists this week is that they're not out to impress anyone with their smarts-- though their knowledge and skills certainly are impressive. They've trying to make a difference in the world and you can only do that by bringing others along.